The Sailor Soldiers go Pop! Inspired by the Japanese shōjo manga franchise Sailor Moon. 12 different mini-figures make up this adorable assortment! This 4-pack contains 4 randomly selected, blind-packaged figures. 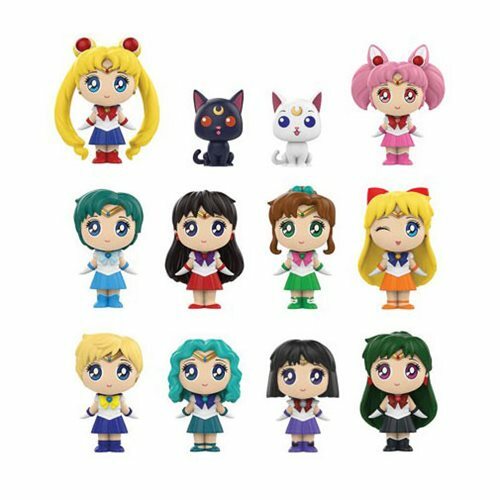 Out of the Japanese shōjo manga franchise Sailor Moon, Sailor Moon, Sailor Mars, Sailor Jupiter, and their comrade Sailor Soldiers make up this adorable assortment of 12 different mini-figures. Each Sailor Moon Series 1 Mystery Minis figure measures about 2 1/2-inches tall, and you'll want to collect them all! Ages 3 and up.